You expect a lot better than this violent, sadistic revenge western from a picture starring Charlton Heston and James Coburn. The latter is the villain whose plan for getting back at former lawman Heston includes kidnapping his virginal daughter (played by Barbara Hershey) and having her raped within his sight. 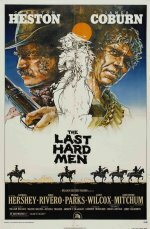 Director Andrew V McLaglen copies Sam Peckinpah's use of slow motion for key moments but misses the relentless intensity the piece needed to be more artistically valid. It is merely nasty.